Big B does it again. 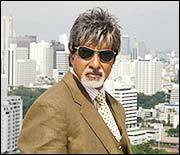 He might be recuperating from illness in real life but in reel life, Amitabh Bachchan shows his resolute, never-say-die attitude. Even today,�he retains his charm and has the capability to draw audiences to the theatres with his new film,�Ek Ajnabee. Shot in Thailand, this Apoorva Lakhia movie reinvents Vijay Dinanath Chauhan (Bachchan's very popular character in Agneepath). Based on the 2004 Hollywood flick Man On Fire (starring Denzel Washington), Bachchan plays the role of retired Indian Army Colonel Suryaveer Singh who is called to Bangkok by Shekhar (Arjun Rampal) for an assignment. The assignment in question is to be the bodyguard of an eight-year-old, Anamika (Rucha Vaidya). Anamika is the only daughter of a millionaire couple (Vikram Chatwal and Perizaad Zorabian). The spate of kidnappings in Thailand leaves the couple with no option but to look for a bodyguard for their daughter.�Anamika's mother prefers a bodyguard who would be a friend to her daughter as well. Suryaveer's past haunts him. During an engagement with terrorists in the Kashmir Valley, Suryaveer accidentally shoots dead two children. The shock is one of the reasons for his heavy drinking habit. Rucha Vaidya matches Amitabh through the first half of the movie as she breathes in life into the dead soul of Suryaveer and gives him a new meaning to life. But hell breaks loose when Anamika is kidnapped by a notorious gang (Raj Zutshi plays the gang leader). Efforts to secure Anamika's release go haywire, and Suryaveer swears to bring the culprits to book. The movie loses steam in the second half after a racy first.�Apoorva, whose previous film Mumbai Se Aayaa Mera Dost was a washout, delivers a fast-paced screenplay. Arjun Rampal tries to do justice to his role, but in vain. Amitabh and child actor Rucha are pillars of this movie and can give this racy caper a good start at the box office.